Discipline is the other side of discipleship. Discipleship without discipline is like waiting to run in the marathon without ever practicing. Discipline without discipleship is like always practicing for the marathon but never participating. It is important, however, to realize that discipline in the spiritual life is not the same as discipline in sports. Discipline in sports is the concentrated effort to master the body so that it can obey the mind better. Discipline in the spiritual life is the concentrated effort to create the space and time where God can become our master and where we can respond freely to God’s guidance. Thus, discipline is the creation of boundaries that keep time and space open for God. Solitude requires discipline, worship requires discipline, caring for others requires discipline. They all ask us to set apart a time and a place where God’s gracious presence can be acknowledged and responded to. The liturgical season of Lent will begin next week. Let us discipline ourselves to create space for God. Yes, for eight years I’ve been posting here. And on the first two blogiveraries I looked at the “state of the blog.” But February is such a busy month that after that I let analysis slip through the cracks. Not only is February my birth month, but it is also Black History Month and the month that hosts Valentine’s Day and President’s Day. Sometimes—although not this year—Lent begins in February. But every February 18 is my blogiversary. Looking back, In 2013, I wrote about Lent; in 2012, I was awaiting the arrival of Mansion of Memory on this date. In 2011, I noted that advance orders for Seriously Dangerous were still open. In 2010, I posted a Black History story. It was only in those earlier years that I took a post inventory, so to speak. Also on that same day, I posted poem. look for you in a poem, Smoke. (so the women could spar). Charlotte, where you broke your shoulder. in a harvest of purest of gold. That one makes me laugh. Today I am reminding readers that Facing a Lonely West is available for advance order at Main Street Rag. Today I am hoping Windows Toward the World is true to her roots. The table is one of the most intimate places in our lives. It is there that we give ourselves to one another. When we say, “Take some more, let me serve you another plate, let me pour you another glass, don’t be shy, enjoy it,” we say a lot more than our words express. We invite our friends to become part of our lives. We want them to be nurtured by the same food and drink that nurture us. We desire communion. That is why a refusal to eat and drink what a host offers is so offensive. It feels like a rejection of an invitation to intimacy. Strange as it may sound, the table is the place where we want to become food for one another. Every breakfast, lunch, or dinner can become a time of growing communion with one another. Care is something other than cure. Cure means “change.” A doctor, a lawyer, a minister, a social worker-they all want to use their professional skills to bring about changes in people’s lives. They get paid for whatever kind of cure they can bring about. But cure, desirable as it may be, can easily become violent, manipulative, and even destructive if it does not grow out of care. Care is being with, crying out with, suffering with, feeling with. Care is compassion. It is claiming the truth that the other person is my brother or sister, human, mortal, vulnerable, like I am. When care is our first concern, cure can be received as a gift. Often we are not able to cure, but we are always able to care. To care is to be human. Once in a while we meet a gentle person. Gentleness is a virtue hard to find in a society that admires toughness and roughness. We are encouraged to get things done and to get them done fast, even when people get hurt in the process. Success, accomplishment, and productivity count. But the cost is high. There is no place for gentleness in such a milieu. Gentle is the one who does “not break the crushed reed, or snuff the faltering wick” (Matthew 12:20). Gentle is the one who is attentive to the strengths and weaknesses of the other and enjoys being together more than accomplishing something. A gentle person treads lightly, listens carefully, looks tenderly, and touches with reverence. A gentle person knows that true growth requires nurture, not force. Let’s dress ourselves with gentleness. In our tough and often unbending world our gentleness can be a vivid reminder of the presence of God among us. What can we say about God’s love? We can say that God’s love is unconditional. God does not say, “I love you, if …” There are no ifs in God’s heart. God’s love for us does not depend on what we do or say, on our looks or intelligence, on our success or popularity. God’s love for us existed before we were born and will exist after we have died. God’s love is from eternity to eternity and is not bound to any time-related events or circumstances. Does that mean that God does not care what we do or say? No, because God’s love wouldn’t be real if God didn’t care. To love without condition does not mean to love without concern. God desires to enter into relationship with us and wants us to love God in return. Let’s dare to enter into an intimate relationship with God without fear, trusting that we will receive love and always more love. 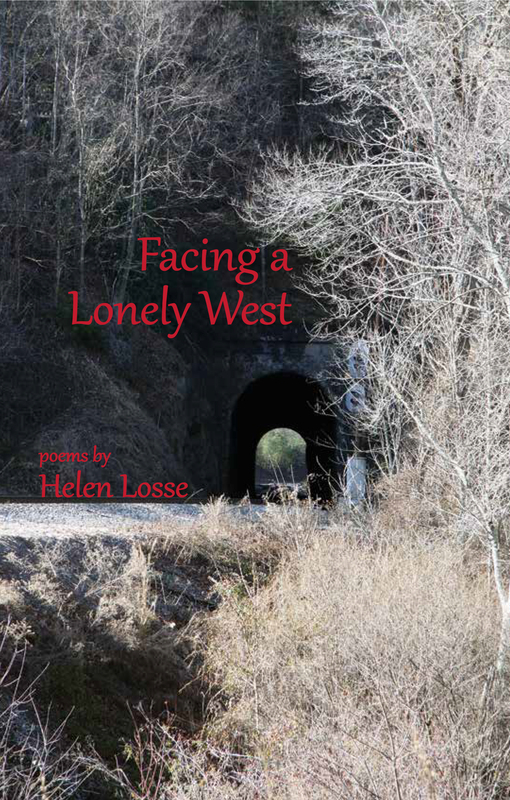 Today is the second day of advance sales for my new poetry book Facing a Lonely West. Have you purchased a copy yet? Advance sales for my new poetry book Facing a Lonely West begin today. My book is due to be released in May from Main Street Rag Publishing Company and will sell for $14, but you can get it now for $9 by placing an advance discount order at the MSR Online Bookstore. Those of you who don’t like buying online, Main Street Rag will take checks, but the price is a flat rate of $13/book, which includes shipping and sales tax. How do we befriend our inner enemies lust and anger? By listening to what they are saying. They say, “I have some unfulfilled needs” and “Who really loves me?” Instead of pushing our lust and anger away as unwelcome guests, we can recognize that our anxious, driven hearts need some healing. Our restlessness calls us to look for the true inner rest where lust and anger can be converted into a deeper way of loving. There is a lot of unruly energy in lust and anger! When that energy can be directed toward loving well, we can transform not only ourselves but even those who might otherwise become the victims of our anger and lust. This takes patience, but it is possible. We need silence in our lives. We even desire it. But when we enter into silence we encounter a lot of inner noises, often so disturbing that a busy and distracting life seems preferable to a time of silence. Two disturbing “noises” present themselves quickly in our silence: the noise of lust and the noise of anger. Lust reveals our many unsatisfied needs, anger or many unresolved relationships. But lust and anger are very hard to face. What are we to do? Jesus says, “Go and learn the meaning of the words: Mercy is what pleases me, not sacrifice” (Matthew 9:13). Sacrifice here means “offering up,” “cutting out,” “burning away,” or “killing.” We shouldn’t do that with our lust and anger. It simply won’t work. But we can be merciful toward our own noisy selves and turn these enemies into friends.